Pre-heat a large skillet over medium-high heat. Add the EVOO to the skillet and the butter. When the butter melts, add the bay leaf, celery, onion and apples. Season with salt, pepper and poultry seasoning and cook for 5-6 minutes, or until the vegetables and apples begin to soften. Add the parsley and stuffing cubes to the pan and combine. Moisten the stuffing with chicken stock until all of the bread is soft, but not wet. Remove the bay leaf and let the stuffing cool either in the pan or in a bowl. Brush a cookie sheet or a metal ovensafe oval tray with EVOO. Form a loaf shape out of your stuffing and bake until set and crisp on top, about 15-20 minutes. For individual muffins:Brush a 12-muffin tin with the additional butter. Add the beaten egg to the cooled stuffing mixture. 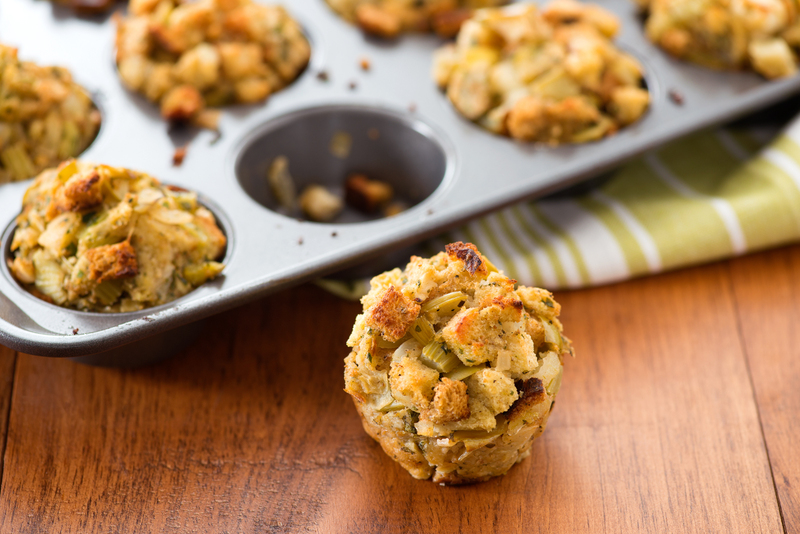 Using an ice cream scoop, fill and mound up the stuffing in the muffin tin. Bake until set and crisp on top, about 10-15 minutes. Remove the Stuffin’ Muffins to a platter and serve hot or at room temperature. In Recipes-list.com we have selected the most viewed recipes from category - uncategorized . Enjoy the best recipes specially selected for you! Apple and Onion Stuffin’ is the right choice that will satisfy all your claims.